I found Walker and Keipert Real Estate, extremely knowledgeable and very helpful when selling our Hendon home. they achieved the price promised with determination and without any exaggeration. Open and honest communication was the determining factor when choosing them to sell our home . 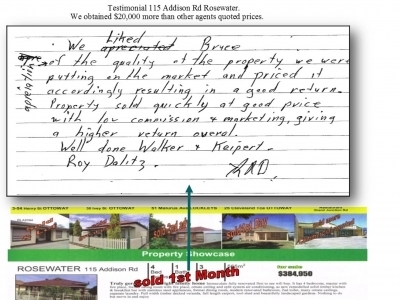 We liked Bruce's appreciation of the quality of the property. We were putting on the market and priced it accordingly resulting in a good return. property sold quickly at a good price with low commission & marketing, giving a higher return overall.